Posted on December 2, 2018 by Andy Higgs in Africa, Mali, Places, Retro Travel Photo. In this new occasional section we share some of the travel photos from our archives – when we paid our dues but rarely our way. Times were tough, hitch-hiking was a favoured mode of transport (even through the Sahara, which was surprisingly easy) and luxury hotels were places we tried to sneak into to have a swim. 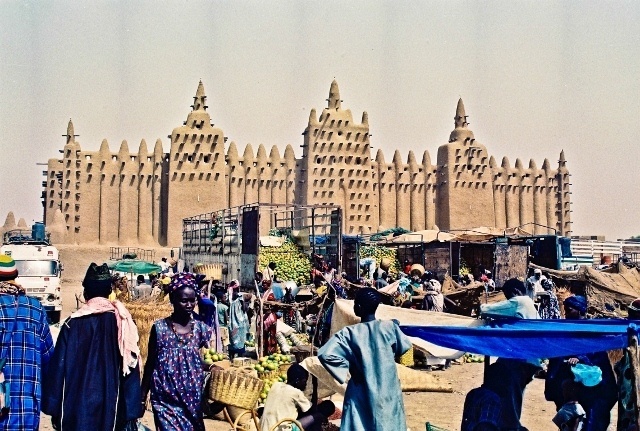 With Mali very much in the news for the wrong reasons, here’s a picture of the stunning Djenne Mosque taken from the market in 1992 in more peaceful times. All pictures from this era were taken with my very first (non-digital) SLR, a Canon EOS something which I eventually sold to a fellow traveller in Africa. The quality is poor due to the age of the original print when scanned.